Helen Bradley was a housewife from Lees in Lancashire in the north-west of England who began painting at the age of 65, thanks in part to the encouragement of L.S. Lowry. Besides brushes, she worked with her fingers, a bread knife and a fish slice, using a dinner plate for a palette. Two years later, she had her first exhibition in London. Her pictures were autobiographical, depicting stick-like maiden aunts and children on trips to the seaside in Edwardian England, inspired by her own childhood and the silky light of 16th-century Dutch painter Pieter Bruegel. When her picture book And Miss Carter Wore Pink was published by Jonathan Cape in 1971, it became an instant international bestseller, revealing a wit and canny eye for description that won her a devoted following. It was the first of four such books. During her meteoric, 15-year career, Bradley was profiled in magazines and made appearances on television and radio. She was awarded an MBE for services to the arts, but died shortly before she was due to receive the award from Her Majesty The Queen. Bradley’s paintings are still very much in demand today, both in Britain and the United States. Anne Redpath was born in Galashiels, Scotland, in 1895, the first daughter of a textile designer. She went on to study at the Edinburgh College of Art, where she was described as the most promising student of her year, and won a travel scholarship to Italy. Her time in Italy was to have a profound influence on her career. Having spent her early years as an artist immersed in the respectable Calvinist tradition, the opulent sense of the divine in Roman Catholic art proved to be a revelation, with the religious tranquillity of the early Renaissance masters informing her subsequent paintings. In 1920 she moved to France with her husband, an architect, and her art took a back seat as she focused on raising three sons. She did not revisit painting in earnest until she returned to Scotland when the relationship ended in 1934. When she did so, however, it was with renewed vigour. From 1942 onwards, as her confidence in her abilities returned, her palette became more vibrant. She was a central figure in the group of painters known as The Edinburgh School, sometimes described as the heirs to the Scottish Colourists. Redpath was an habitual traveller in her latter years, her journeys across Europe becoming the subject of her work; she was well-known for her landscapes, still lifes and pictures of church interiors, such as the example offered in London on 9 April (above). Redpath was president of the Scottish Society of Women Artists from 1944-47, working tirelessly to promote the paintings of women who had been ignored by the British establishment. In 1952 she became the first woman artist to be elected to the Royal Scottish Academy as an Academician, and today her works can be found in the National Gallery of Scotland. Eileen Agar was born into considerable wealth in Buenos Aires, daughter to a Scottish father and an American mother. The family relocated to London when she was 11 years old. After studying art at various schools, including The Slade, Agar briefly swapped middle-class respectability for Left-Bank Paris, and an artistic environment populated by the likes of Picasso, Lee Miller, André Breton and Paul Éluard. Falling under the spell of Surrealism, she would become one of the most diverse British artists of her era, instilling her passion for music and nature in imaginatively playful objects, collages, photographs and paintings. Agar is often described as a Surrealist — in part because she was one of the few female artists to participate in the notorious International Surrealist Exhibition of 1936 (at which Salvador Dalí almost suffocated while wearing a diving helmet). In her biography, Agar explained that it was actually Roland Penrose and Herbert Read who declared she was a Surrealist and, bemused, she went along with it. Beautiful, witty and brilliantly imaginative, Agar was later described as a ‘seaside Surrealist’ for her beachcombing still-life paintings that revealed a sharp eye for the uncanny in objects. These were largely inspired by her intense relationship with Paul Nash, who introduced her to the concept of the found object. Today, the Tate owns several of Eileen Agar’s paintings, including the wonderfully supernatural Head of Dylan Thomas (1960). Anne Estelle Rice studied art in Pennsylvania before leaving her native city for Paris in 1906. In the summer of the following year she met the Scottish artist John Duncan Fergusson, who encouraged her to quit her job as a fashion illustrator for an American magazine and become a painter. In Paris, Rice came into contact with the paintings of the Fauves, including André Derain and Henri Matisse, and soon joined the ‘Wild Beasts’ in their celebration of pure colour and simplified forms. Her works attracted the attention of the non-conformist Bloomsbury set, and she was soon contributing to the English journal Rhythm, which promoted the latest radical developments in art and philosophy occurring in Bohemian Paris. After marrying the art and theatre critic Raymond Drey in 1913 she moved to London, where she quickly became part of the literary set that centred around her close friend Katherine Mansfield (1888-1923). Rice is responsible for the renowned red portrait of the novelist, painted in 1918 and now held at the Museum of New Zealand. Of the artist, Mansfield wrote, ‘You know she is an exceptional woman — so gay, so abundant — in full flower just now and really beautiful to watch’, and dedicated the short story Ole Underwood to her. From the 1920s Rice painted warm, rich still lifes, which were exhibited at galleries in England. She remained a frequent visitor to France, and sold paintings to collectors there and in Holland, Denmark and Germany. Bold, expressive and imbued with a satisfying tension, Mary Fedden’s kitchen-table still-life paintings feature jugs and vases of flowers rendered in vivid, contrasting colours. Between 1932 and 1936, Fedden studied under the theatre designer Vladimir Polunin at the Slade School of Art in London, and one of her first paid jobs was producing stage designs for Sadler’s Wells Theatre and the Arts Theatre. During the Second World War, she was commissioned to produce patriotic murals. She developed her signature still-life style after the war, and admitted to being inspired at various times by the early works of Ben Nicholson, Picasso and Braque. Yet there was also a surreal quality to her art, in which objects were suspended against strangely hallucinatory backgrounds. Unsurprisingly, Fedden was often in demand as an illustrator. 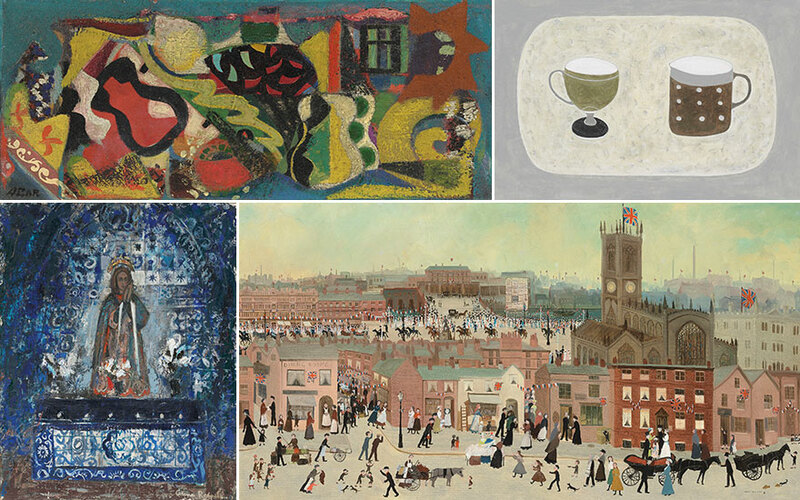 Married to the charismatic printmaker Julian Trevelyan (1910-1988), Fedden had to work hard to get noticed by the English avant-garde, despite exhibiting in solo shows throughout the United Kingdom every year from 1950 until her death. From 1958 to 1964 she taught at the Royal College of Art, where her pupils included David Hockney and Allen Jones. The artists she counted among her friends included Eileen Agar, Henry Moore, John Piper and Ceri Richards. In 1992, she was elected to the Royal Academy. ‘I’ve always said my life has been ruled by great luck over small things,’ she said in later life. Rachel Nicholson was born into an extraordinary artistic background — her mother was the sculptor Dame Barbara Hepworth and her father was Ben Nicholson. It was partly the burden of this heritage that stopped her from pursuing a career in art in early life. Nicholson did not begin to paint until her her mid-forties, by which time her children were at school. She quickly established a reputation for rhythmically beautiful landscapes and minimal still-life paintings that were inspired by her father’s sense of space. As a child, she had been surrounded by modern masters — Henry Moore, Naum Gabo and Alfred Wallis. On one occasion, Piet Mondrian had come to tea and shocked her by putting his knife in his mouth.